I’ll probably regret this. I’ve got two six-week old newborns that are happily fed and snoozing away. I too should be sleeping. I shouldn’t be baking. I shouldn’t be blogging. However, fortune is on my side and she has come disguised as my mother. This divine woman has given up a few months of her life in NYC to come and help me care for the two new additions to our family. Over the last few nights, with a little help from a breast pump, she has taken over the dreaded middle of the night wake up call and fed our two little darlings. This means for the first time in over a month, I have had a stretch of uninterrupted sleep (five hours is a lot these days!) and that makes me feel like the Bionic Woman! Sleep is a precious thing. With all that extra energy I wanted to do something I haven’t been able to do in a long while: spend some time in the kitchen. This whole new lifestyle has pumped up my cravings for cake. Probably not a good thing since I still have about 10 pregnancy pounds to shed. But, I gotta have my cake! Stocked up in the fridge was a container of buttermilk and a basket of blueberries. 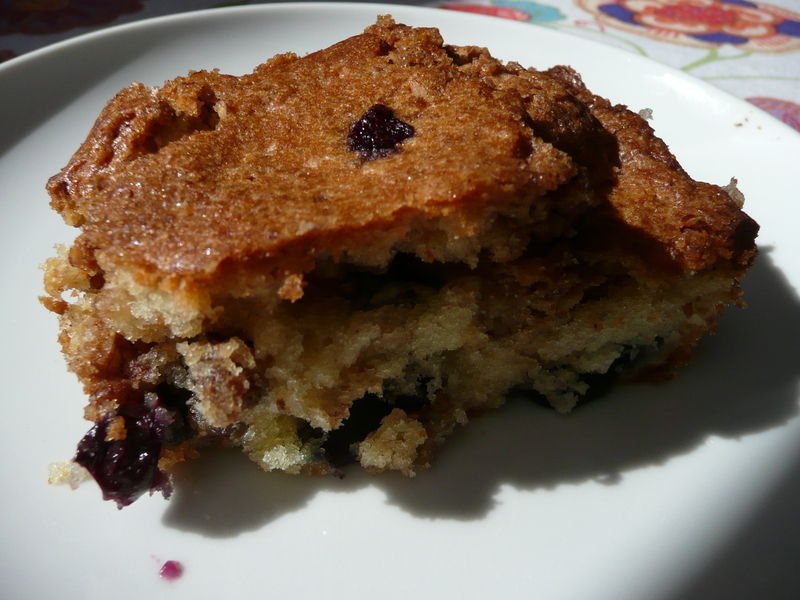 That combination called for a Blueberry Buttermilk cake with a spiced pecan topping. A perfect way to make the transition from summer to autumn. In a large bowl, cream 1/2 cup butter with the granulated sugar until light and fluffy. Beat in eggs and vanilla. In a medium bowl, sift together flour, baking powder, baking soda, and salt. Stir into butter mixture. 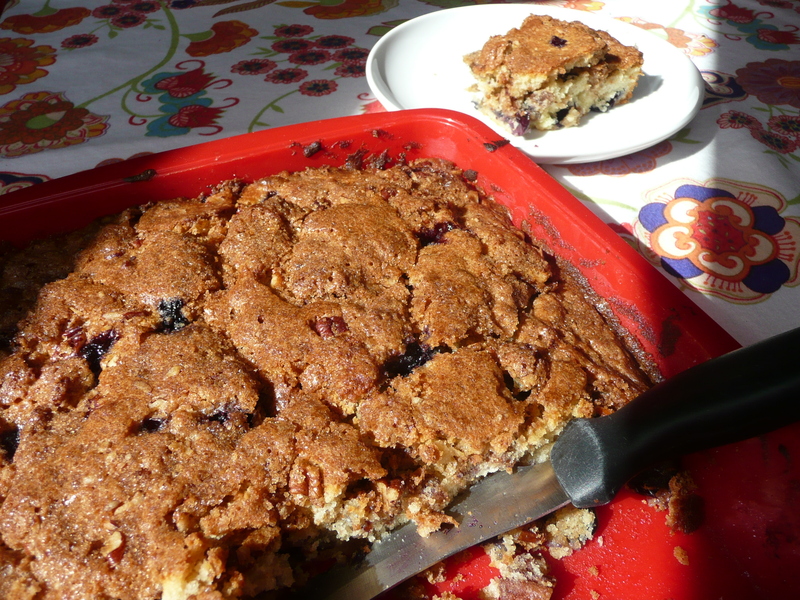 Add buttermilk and mix; gently fold in blueberries. In a small bowl, stir together the brown sugar, cinnamon, nutmeg, and pecans. Pour half the cake batter into a greased 8-inch square baking pan. Sprinkle with half the brown sugar mixture and top with the remaining batter. Combine the remaining brown sugar mixture with 2 tablespoons butter and sprinkle over the top of the batter. Bake until toothpick inserted into center comes out clean, about 45-50 minutes.